There is no such thing as typically New York food, it's a montage of everything from everywhere. With a Starbucks thrown in every few blocks, of course :) I've had many New York slices, several Chinese soupy dumplings, quite a few Korean scallion pancakes, Indian kathi rolls, Belgian waffles, Mexican street food, Japanese ramen, Southern soul food, and the mandatory burger, meatballs, lobster roll, cookie (shot, mind you! ), donut and cheesecake. Alright alright, I never had the hot dog. There I've said it. Got to leave something for next time too. Did I love it all? Yes! Have I found the best pizza in NYC? No! But here is my top 10 New York food list. Don't give these places a miss if you visit. On my first night in New York, my friend took me to Chinatown, to eat scallion pancakes (pictured above) and dumplings at Nom Wah Tea Parlour. The waiter was in a bit of a rush as ours was the last order, but this meant that we just asked for all sorts of things off the menu without giving it much thought, which in turn turned out to be a fantastic idea! Everything was delicious. The turnip cakes, the greens, the soupy shrimp dumplings, the assorted dim sum platter. My favourite was the lovely crisp scallion pancake. I had more of these on my last night in Manhattan, at BonChon (where I also ate Korean fried chicken for the first time. Much better than the usual stuff! Also, I have to say here that the pancakes in New York are quite different from the ones I've had at Korean restaurants in the UK - they're thicker and have more filling here in England. Like them both though). Two friends recommended Biryani Cart. A food truck at the SW corner of 46th Street and 6th Avenue. This was meant to be a pre-dinner sampler, but we ended up with two massive rolls, which meant we had to put dinner plans (Vatan, all you can eat Gujarati fare on 23rd street) on hold for another day. Not that I'm complaining. This chicken tikka kathi roll was yum. Spicy juicy filling and a crumbly maida paratha rolled around it. Like a cross between a Nizam kathi roll in Delhi and a Bombay frankie. Next time I go, I'll try their Biryani. A word for food trucks in New York - they're everywhere and you can't not love them. Everything from waffles to Falafel, and so cheap! I paid around $4 I think for those rolls! That same night, after a great deal of walking around and taking in the night lights and life of Hell's Kitchen and Times Square, and watching bartenders turn into table-top dancing cowboys, we got a tad peckish. That could only mean one thing. 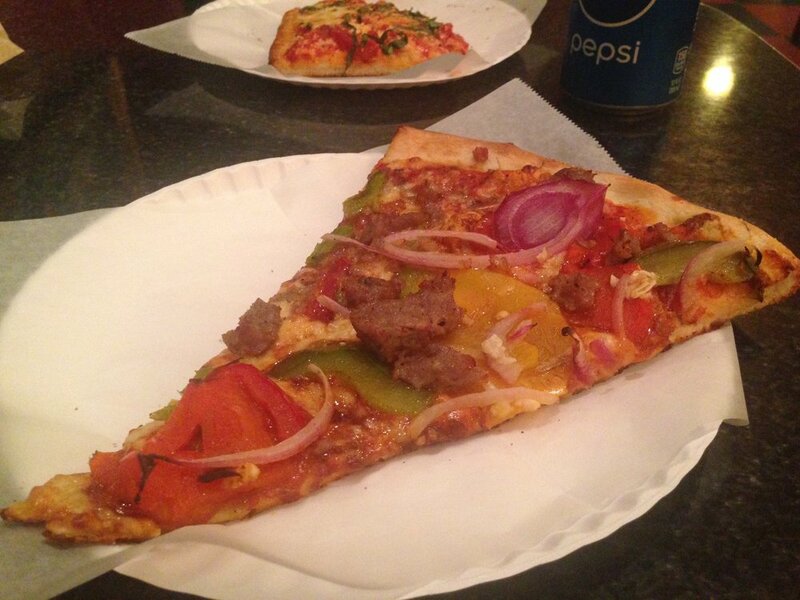 A New York slice! So I had the third of my trip thus far, and liked it best. This was at Two Boots in Hell's Kitchen, and was called Cleopatra Jones. Garlicky Italian sausage, roast peppers and onions, a spicy tomato sauce and cheese, on a crumbly base that I believe had cornmeal incorporated in it. I really enjoyed it! We weren't done with Hell's Kitchen. Wednesday night dinner was at Totto Ramen. I was meeting an old friend and his wife and we decided to brave the fabled lines outside the restaurant for what I was promised was going to be a great bowl of noodles. The wait was over an hour (we managed to squeeze in a pint at Molloy's Irish pub by sneaking out unnoticed, where the bartender was most pleased to hear a spot of British accent amidst the American. He couldn't stop smiling!! ), and I wasn't disappointed. My spicy chicken ramen with fried garlic and boiled egg on top, was gorgeous. I've had plenty of ramen in London, but nothing as good as this one. My friends had the extra spicy version, which had about 7 little red chillies against it on the menu (! ), and they loved theirs too. I had to visit Dominique Ansel Bakery. But of course. The cronut unfortunately was sold out. But of course. 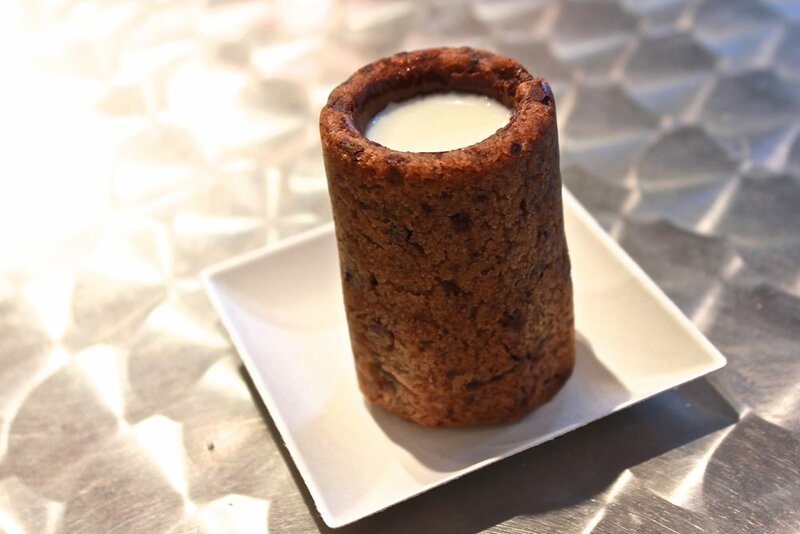 The cookie shots were just beginning though, hurrah! What a clever idea. Take two things that traditionally go together and make them one wicked thing. The lady at the till suggested we drink/eat it immediately, but I wanted to take a picture or two, and so when I finally drank this, the milk was all chocolatey from the cookie and the cookie insides all soft from the milk, and it was perfect :) The bakery had quite a few other interesting bakes that looked very tempting: the freshly made madeleines, hooties, and kouign amann were the three other things I'd have loved to try out. Back to dumplings! That night we decided to take the metro to Jackson Heights and walk down Roosevelt Avenue to Flushing, sampling the ethnic diversity of New York and its street food. In downtown Flushing, down Prince Street, we walked into Xiang Xiao Long Bao, and had a basket of prawn and pork dumplings filled with soup! Quite an interesting experience eating them. You pick up a dumpling with your chopsticks and then you have the option of either popping it whole (and VERY hot!) into your mouth, or taking a bite off it, holding the soup spoon that comes with it, below your mouth, to catch the soup! I loved them. On a cold night, so comforting. Right across the road from Xiang Xiao Dumpling House, is the traditional Xinjiang BBQ cart. You can't miss it, there's constantly a crowd around it and there's that irresistible smell of BBQing meat and fish. There's a few different types of marinade they keep slapping on to these Chinese skewers, and I haven't a clue what they were, but they were very tasty. I got the eggplant skewer and my husband got a prawn, and we walked to the number 7 train, feeling very content. OK fries!! How could they not be on this list? Two places with great fries. Home Frite who have a stall at the Smorgasburg food market in Brooklyn (think they sell at other places too, I'd check their website for an update before I step out. On a side note, Smorgasburg is great if you're keen on trying out what New York's very active food entrepreneurs are dishing out. As a bonus, you get a fantastic view of the Manhattan skyline) and Pommes Frites (I ate at their outlet in East Village). Home Frite's fries (first picture above) - tossed in black truffle oil and parmesan, and served with lemon garlic aioli. Oh my God! And Pommes Frites' paper cone filled with double cooked fries and served with your choice of extraordinary sauces (in their own words, and I do not disagree). We had the rosemary mayonnaise. OH MY GOD! Last meal in New York, to seal all the other great ones, and to take back a bit of Maine with us, lobster rolls at Luke's Lobster. Recommended by my ex-boss in London, and recommended in turn to me, by my friend here. 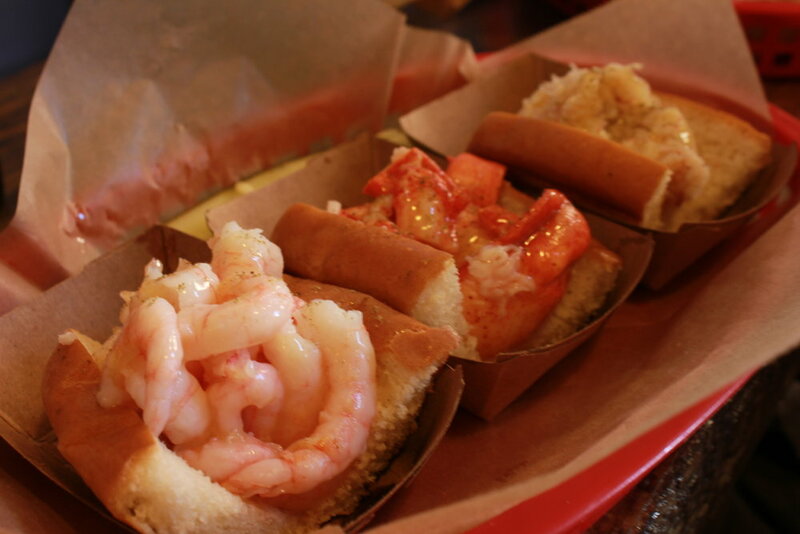 Soft, buttery bread, fresh seafood, gentle seasoning. Heaven. We couldn't make up our minds about whether we wanted crab, or shrimp or lobster, so we had what Luke's Lobster called Noah's Ark. The best of all worlds. Lobster was my favourite, followed very closely by crab. Great lunch. You'll find them on 81st Street, Upper East. I've got to start saying it like they say it in New York, don't I?! E81? E 81 St.?